Activison Blizzard's CEO is not afraid TOR will steal money from World of Warcraft. The cash cow of WoW is showing its age a bit. Back when Bobby Kotick's Activision merged with Blizzard in 2008, the MMO was riding high with more than 12 million subscribers and TV spots all over the Super Bowl. In the last year though, customers have been departing Azeroth for greener pastures, with Activision reporting a loss of 800k subscribers down to a total of 10.3 million at a earnings call this month. Rival Electronic Arts has been trying to dethrone Activision's shooter franchise, while simultaneously betting heavily on BioWare's The Old Republic delivering the final death blow to WoW. Bobby Kotick isn't buying it. Due to how licensing deals with LucasArts have worked for him in the past, he thinks any money TOR makes will benefit LucasArts more than EA, and he scoffed at the Star Wars game stealing subscribers from his own MMO. 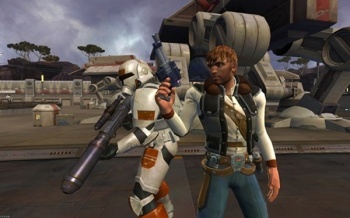 Activision and LucasArts have had a long relationship - Force Unleashed, LEGO Star Wars - so Kotick doesn't believe that the licensing contract will allow EA to make as much bank off TOR as pundits are predicting. "We've been in business with Lucas for a long time and the economics will always accrue to the benefit of Lucas, so I don't really understand how the economics work for Electronic Arts," he said. "Lucas is going to be the principal beneficiary of the success of Star Wars." Kotick also isn't very impressed with all of the so-called WoW-killers which have emerged over the years. "If you look at the history of the people investing in an MMO and achieving success, it's a small number," Kotick said. Whether it's Age of Conan, Rift or even The Old Republic when it comes out on December 20th, Kotick is betting that WoW will still reign supreme come 2012. At least, until Blizzard's new MMO - codenamed Titan - is announced.